large carpenter bees, Xylocopa spp. 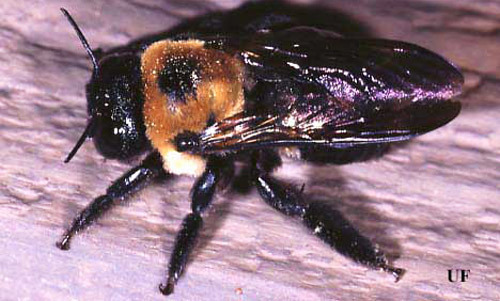 In America north of Mexico, the subfamily Xylocopinae is composed of two genera, Ceratina (small carpenter bees) and Xylocopa (large carpenter bees). These bees get their common name from their nesting habits: small carpenter bees excavate tunnels in pithy stems of various bushes; large carpenter bees chew nesting galleries in solid wood or in stumps, logs, or dead branches of trees (Hurd and Moure 1963). The large carpenter bees may become economic pests if nesting takes place in structural timbers, fence posts, wooden water tanks, or the like. The genus Ceratina has 21 species in America north of Mexico, two of which occur in Florida (Daly 1973). Xylocopa has seven species in America north of Mexico, with two species found in Florida. Figure 1. Adult large carpenter bee, Xylocopa sp. Photograph by Paul M. Choate, University of Florida. Xylocopa micans Lepeletier is known from southeastern Virginia down the East coast of the U.S. to Florida, west to Texas, and south to Guatemala. The typical form of Xylocopa virginica (Linnaeus) is known throughout the eastern United States southward to Texas and northern Florida; the subspecies Xylocopa virginica krombeini Hurd is restricted to Florida from Sumter and Lake Counties south to Dade County (Hurd 1955, 1961). At various times, carpenter bees have been placed in the families Anthophoridae, Xylocopidae, and Apidae. 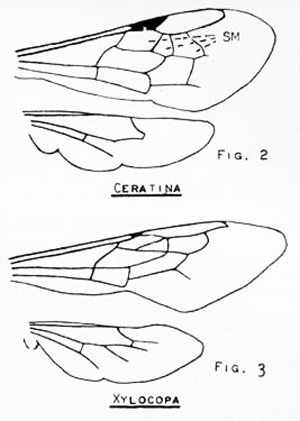 Hurd and Moure (1963) traced the taxonomic history of these bees and found the most recent placement is within the Apidae (Krombein 1967). This family is characterized, in part, by the jugal lobe of the hind wing being either absent or shorter than the submedian cell and by the forewing having three submarginal cells. 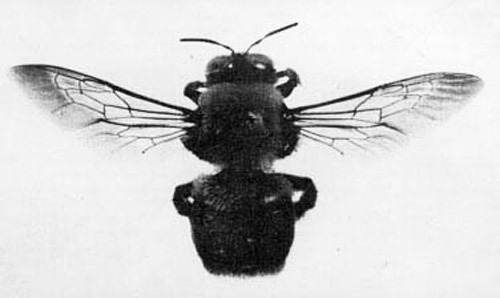 Within the family, carpenter bees are distinguished most easily by the triangular second submarginal cell, and by the lower margin of the eye coming almost in contact with the base of the mandible (i.e., the malar space is absent). The easiest method of separating Ceratina from Xylocopa is by size: Ceratina are less than 8 mm in length, whereas Xylocopa are 20 mm or larger. Figure 2. Differences in wing venation between the small carpenter bees, Ceratina spp., and the large carpenter bees, Xylocopa spp. Drawings by Division of Plant Industry. Xylocopa generally resemble bumble bees in size and somewhat in color, being black, metallic bluish or greenish black, or purplish blue. Some males have yellowish areas on the face. Both sexes may have pale or yellowish pubescence on the thorax, legs, or abdomen, but these hairs are not as abundant or as intensely colored as in bumble bees. Large carpenter bees are readily distinguished from bumble bees primarily by the absence of pubescence on the dorsum of the abdomen, which is somewhat glossy. They also lack a malar space (present in bumble bees), and the triangular second submarginal cell. The two species of Xylocopa which occur in Florida are the only species in the eastern United States, namely Xylocopa micans Lepeletier and Xylocopa virginica (Linnaeus). Figure 3. Adult large carpenter bee, Xylocopa virginica (Linnaeus), with wing venation evident. Photograph by Division of Plant Industry. Figure 4. Xylocopa heads: A: female; B: male. Xylocopa micans: Little is known of the life history of this species. Hurd (1958) photographed a nest constructed in a dead Ligustrum branch. According to his report it was a sound twig with a diameter of 2.5 cm or more. The nest entrance was about 1 m above the ground, but entrances in other twigs were as low as 15 cm. The senior author found Xylocopa micans actively nesting in a red maple branch similar to the one reported by Hurd (1958). The twig was 1.6 cm in diameter near the nesting area, and projected straight up from the ground. The entrance was approximately 1.5 m from the ground and was 8 mm in diameter. The lowermost, or first, brood cell was 12 cm below the nest entrance. Three cells had been constructed when the nesting activity was interrupted on 13 May 1975. Figure 5. Large carpenter bee, Xylocopa micans Lepeletier, nest in twig; entire twig (top) and longitudinal section (bottom). Photograph by Division of Plant Industry. Xylocopa virginica: Much has been written about this species: Rau (1933) provided one of the most complete accounts of its biology; Hurd and Moure (1963) cited many literature references; Balduf (1972) provided the most up-to-date summary of biology and literature; Sabrosky (1962) provided additional mating behavior. The following account of life history is condensed from Balduf (1962): "Most reports indicate the use of dry, structural coniferous woods as nesting sites. Wood included Taxodium, Pinus, and Juniperus. Reports were also given for Magnolia planks and deciduous woods used in fence railings. Xylocopa virginica selects nesting sites in well-lighted areas where the wood is not painted or covered with bark. In general, these bees were gregarious, tending to nest in the same areas for generations. Old nests were refurbished, but new nests were also started. In new nests, female bees chewed their way into the wood, excavating a burrow about 15 mm in diameter. Boring proceeded more slowly against the grain (about 15 mm a day) than with the grain. The direction of galleries in the wood appeared to depend on the direction of the grain. If the grain were oriented vertically, the nests were vertical; if horizontally, then the nests were horizontal with respect to the ground. Galleries extended about 30 to 45 cm in newly completed nests. New tunnels were smooth and uniform throughout, but older galleries showed evidence of less uniformity with random depressions and irregularities. These older galleries were believed to have been used by several generations of bees. After excavating the gallery, female bees gathered pollen, which was mixed with regurgitated nectar. The pollen mass was placed at the end of a gallery (or bottom if the nest were vertical), an egg was laid, and the female placed a partition or cap over the cell composed of chewed wood pulp. This process was repeated until a linear complement of six to eight end-to-end cells was completed. Females apparently constructed only one nest per year in the North; bees emerged in the late summer and overwintered as adults with mating taking place in the spring. In Florida, however, Hubbard (in Howard 1892) reported at least two generations per year with broods in February-March and during the summer. Bees were active from November to January and from April to summer." Chandler (1958) lists four types of damage done by carpenter bees: weakening of structural timbers, gallery excavation in wooden water tanks (especially in arid western areas), defecation streaking on houses or painted structures, and human annoyance. The last point is included since carpenter bee females may sting (rarely), and male bees may hover or dart at humans who venture into the nesting area. In general, carpenter bees are not much of a problem. Carpenter bees rarely attack painted or varnished wood. 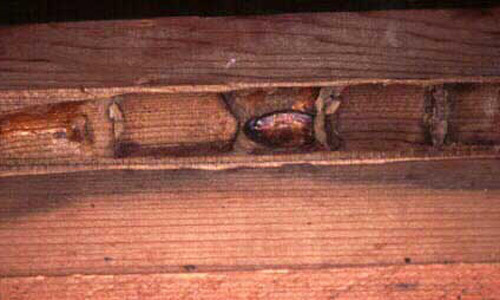 These bees often cause problems on structures by boring into the surface of the wood used as the back face of the trim under the eaves, as this surface is usually not painted. A buzzing or drilling sound is heard when the bee is boring into the wood. If the hole is not visible, often the case when the bee is boring into the backside of trim, look for sawdust on the ground under the hole. Figure 6. 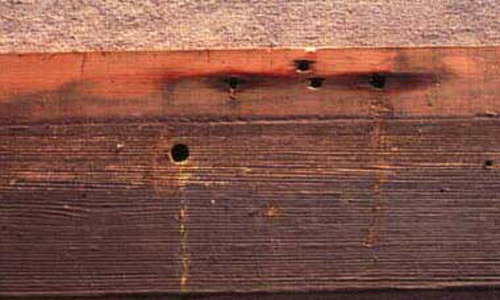 Entry hole drilled into structural wood by a large carpenter bee, Xylocopa sp. Photograph by University of Florida. Figure 7. Internal damage to structural wood by a large carpenter bee, Xylocopa sp., showing individual larval cells. Photograph by University of Florida. If problems do arise, use a small amount of insecticide that is labeled for bees and wasps: this can be dust, wettable powders, microencapsulated products, or aerosols. The labeled pesticide should be blown into the nesting holes. This is more safely done with aerosols than with the other formulations. After a few days, the holes should be plugged with plastic wood, putty, or similar substance to allow the adult female to become exposed to the pesticide. Balduf WV. 1962. Life of the carpenter bee, Xylocopa virginica (Linn.). Annals of the Entomological Society of America 55: 263-271. Chandler L. 1958. Seven species of carpenter bees are found in the United States. Pest Control 26(9): 36, 38, 40, 47. Daly HV. 1973. Bees of the genus Ceratina in America north of Mexico. University of California Publication Entomology 74: 1-113. Howard LO. 1892. Note on the hibernation of carpenter bees. Proceedings of the Entomology Society of Washington 2: 331-332. Hurd PD Jr. 1955. The carpenter bees of California. Bulletin of the California Insect Survey 4: 35-72. Hurd PD Jr. 1958. Observations on the nesting habits of some new world carpenter bees with remarks on their importance in the problem of species formation. Annals of the Entomological Society of America 51: 365-375. Hurd PD Jr. 1961. 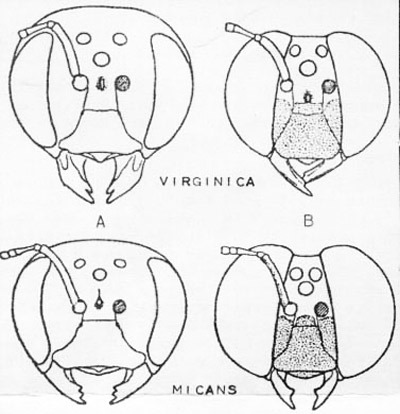 A synopsis of the carpenter bees belonging to the subgenus Xylocopoides Michener. Transactions of the American Entomological Society 87: 247-257. Hurd PD Jr, Moure JS. 1963. A classification of the large carpenter bees (Xylocopini). University of California Publication Entomology 29: 1-365. Krombein KV. 1967. Apoidea. In Hymenoptera of America North of Mexico, Synoptic Catalog. Second Suppl. U.S. Department of Agriculture Monograph 2: 514-515. Mallis A. (ed.) 1990. Handbook of Pest Control. 7th Edition. Franzak & Foster Co. Cleveland. 1152 pp. Mitchell TB. 1962. Bees of the Eastern United States. Vol. II. North Carolina Agriculture Experiment Station Technical Bulletin No. 152: 1-557. Rau P. 1933. The Jungle Bees and Wasps of Barro Colorado Island. Privately printed, Kirkwood, MO. 324 pp. Sabrosky CW. 1962. Mating in Xylocopa virginica. Proceedings of the Entomology Society of Washington 64: 184. Originally published as DPI Entomology Circular 160. Updated for this publication. Publication Date: July 1999. Latest revision: June 2014. Reviewed: December 2017.